EU Competition Law, Data Protection and Online Platforms provides a highly topical study of how EU competition law interacts with data on online platforms. All agree that the digital economy contributes to a dynamic evolution of markets and competition. Nonetheless, concerns are increasingly raised aboutthe market dominance of a few key players. Since these companies hold the power to drive rivals out of business, regulators have begun to seek scope for competitionenforcement in cases where companies claim that withholding data is needed to satisfy customers and cut costs. This book is the first to focus on how competition law enforcement tools can be applied to refusals of dominant firms to give access to data on online platforms, such as search engines, social networks, and e-commerce platforms – commonly referred to as the ‘gatekeepers’ of the Internet. data-related competition concerns in merger cases. The author draws on a wealth of relevant material, including EU and USdecision-making practice, case law and policy documents, as well as economic and empirical literature on the link between competition and innovation. The book concludes with a proposed framework for the application of the essential facilities doctrine to potential forms of abuse of dominance relating to data. This book is an evaluation of how existing laws and concepts can be applied to data-related competition concerns in digital markets. 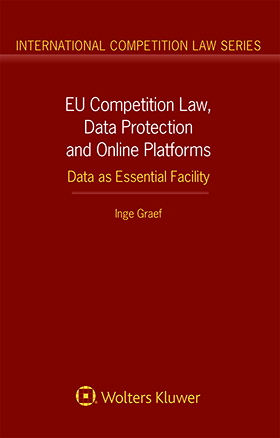 It serves as an invaluable contribution to ongoing academic and policy discussions about how data-related competition concerns should be addressed under competition law and evaluates how existing competition tools for market definition and assessment of dominance can be applied to online platforms. The economic insight thus gained is of practical value to many jurists, business persons, and academics concerned with this very timely subject.